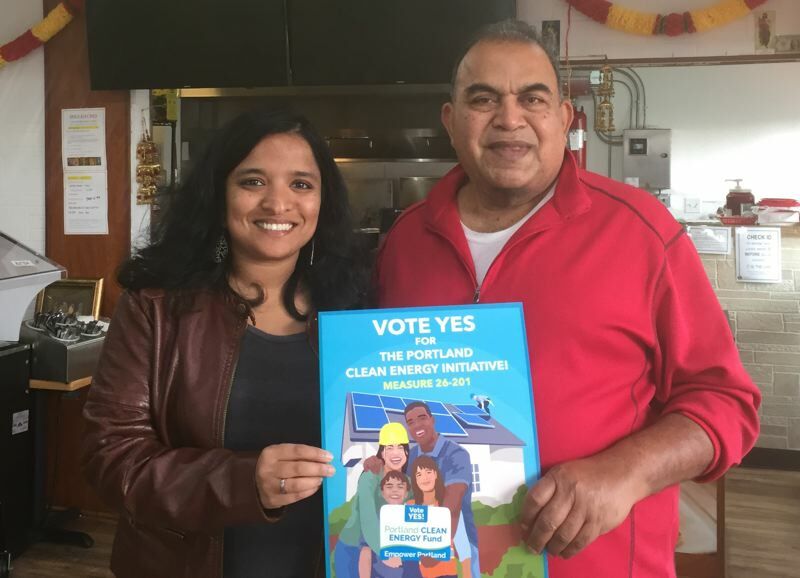 The Portland Clean Energy Fund no and yes campaigns are still arguing over the endorsements of two restaurateurs who are not fluent in English. The Oregon Secretary of State's office has quickly dismissed a formal complaint against Keep Portland Affordable after featured opponents to city Measure 26-201 changed course and said they were misled. Keep Portland Affordable said the Oct. 29 decision — just four days after the complaint was submitted by the Yes for Portland Clean Energy Fund — shows it lacked merit. "We're thankful that the Secretary of State's office saw through this publicity stunt and dismissed this frivolous complaint," reads a statement released by the no campaign for Measure 26-201. Portland restauranteurs Eva Liu and Harry Lal were approached by yes campaign supporters after their pictures, names and business names were attached to no campaign materials. A spokesman for the no campaign, who did not want to be named, said in an email Friday that the two were approached several times and signed legal documents attesting to their opposition. But yes campaign supporters who spoke their native languages — Mandarin and Hindi, respectively — said the two thought they were signing on to oppose a tax on groceries and soda. Liu and Lal switched endorsements after talking to the yes campaign. Damon Motz-Storey, a yes campaign spokesman, pointed to similar news stories out of Washington of Spanish-speaking people also claiming they didn't know that they were signing on to oppose a carbon tax measure they actually supported. Jenny Lee, advocacy director of the Coalition of Communities of Color, in a statement from the campaign, said the two didn't understand what they were signing. "Ms. Liu and Mr. Lal both support the Portland Clean Energy Initiative, and both of them said very clearly that they did not realize that they had been signing on to oppose it," Lee said. "It's disappointing that the Secretary of State's office has dismissed this claim when it's clear that the 'no' campaign did not obtain informed consent. We invite Portlanders to stand with these small business leaders and vote yes on Measure 26-201." The no campaign, not surprisingly, has a different view. "It's important that Portlanders remain focused on what this measure is really about— it's a $166 a year tax that will be paid by families across Portland," reads the no campaign statement. "It will increase the cost of goods and services that we buy every day and it will hit those who can least afford it the hardest. We hope Portlanders will join us in voting 'no' on Measure 26-201."